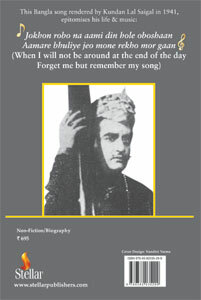 A unique voice and singing style that could not possibly be emulated, and an acting prowess that complemented the gifted throat, earned Kundan Lal Saigal a distinct place in the annals of Indian cinema. A bi-lingual actor, he commenced his cinematic sojourn with New Theatres, and touched the zenith with Devdas in 1935, that was to become an all-time classic. With each successive venture – President, Dharti Mata, Street Singer, Zindagi, Bhakt Surdas, Tansen, Shahjahan, et al – he kept soaring to reach the zenith. With the release of his maiden Bengali film, Didi, he captured the hearts of Bengal’s cognoscenti. And his songs in Bangla received approbation of the Nobel Laureate Gurudev Rabindranath Tagore: “Ki shundar gala tomar! Aage jaane le katayi na anand petam.”No non-Bengali singer had been conferred such praise before or after Saigal. repertoire in varied genres of songs, ghazals, bhajans, as also in other modes of classical style enthralled the masses, as these renditions made them laugh and cry. A film career that merely lasted fifteen years (1932-1946), he performed in just about 36 films and rendered about 185 songs in Hindi, Urdu, Persian, Punjabi, Bangla and Tamil, thus proving the dictum that it’s not the extensiveness but the intensity of those renderings that bequeaths the mantle of immortality. Thisnational award-winning biography of a peerless classic singer is a premier enterprise, as also a signal tribute. 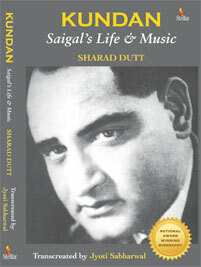 Archival records, rare photographs and posters of Saigal’s films in this tome, give insightful glimpses, and beckon collectorsand connoisseurs. With five decades dedicated to the electronic media, the 1946-born Sharad Dutt is a famed, versatile producer. A former Deputy Director General of Doordarshan, his contribution to the Public Service Broadcaster has been phenomenal, indeed. Among his foremost notable productions are his sixty-five documentaries on the Indian Armed Forces, besides the World of Nature, that was anchored by writer-journalist Khushwant Singh. Dutt is also credited with bringing Indian literature and litterateurs on the small screen and introducing the universe of books to common viewers. Being a cinephile, Dutt ensured that celluloid celebs appeared on television, and he also documented the celebrated stars, which was an innovative move in docu-features. was conferred the National Award (Swarna Kamal 2003) for best book on Indian cinema, and it was an encore for his biography,Kundantoo, winning the National Award (Swarna Kamal 2005). He has co-edited five volumes of the selected works of Saadat Hasan Manto, Dastavez, with Balraj Manra; been on the jury of National Film Awards;and also been a member of the Governing Council of Lalit Kala Akademi and Sahitya Akademi Committee for documentaries on literarylegends. Jyoti Sabharwal is a former journalist, and founder-publisher, Stellar. She has co-authored the memoirs and penned biographies of numerous hi-end achievers that include Amrish Puri, Vyjayantimala and Begum Akhtar. Her most recent publication was the biography of illustrious scholar, Dr Kapila Vatsyayan, Afloat a Lotus Leaf. She has also transcreated Akshron ke Saaye (Shadows of Words), the autobiography of the poetess of the millennium, Amrita Pritam.